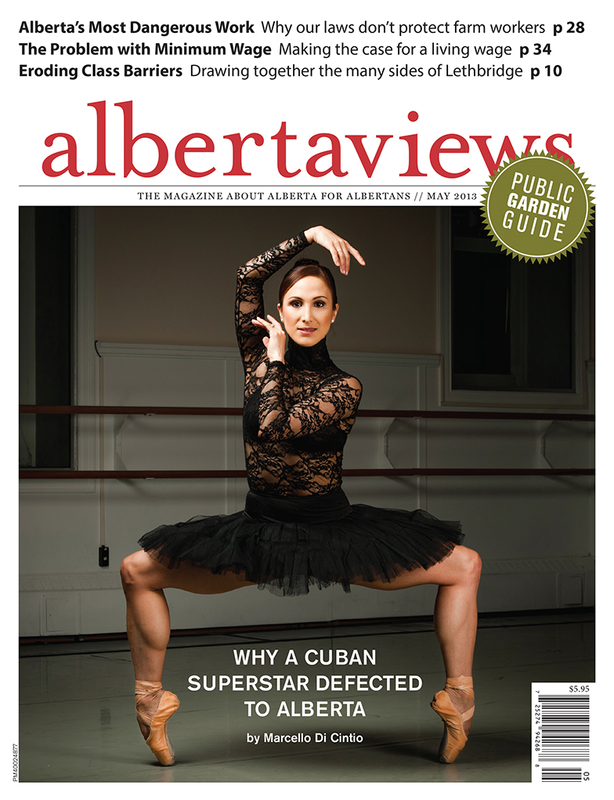 My story about Hayna Gutierrez, a star Cuban ballerina who now dances for Calgary-based Alberta Ballet, appears in the current issue (May 2013) of Alberta Views. I met wit Hayna last winter when the company was preparing for their annual performance of The Nutcracker. For my research, I briefly sat in on one of the rehearsals. I expected to see a troupe of dancers learning to be sugarplum fairies. I thought I’d watch teachers and directors instruct the dancers artistically. Teaching them to be beautiful. Of course, anyone who has seen an Alberta Ballet performance knows that, on stage, the dancers do, in fact create art. They are pure and gifted artists. They appear weightless on stage, and resemble the birds and fairies that their movements are meant to represent. I feel fortunate, though, to have been granted an insight in the physical training that forms the muscular foundation for this artistry.